ww2dbaseIra Hamilton Hayes was born on the Gila River Indian Reservation in Arizona, United States. He enlisted in the United States Marine Corps in 1942 and was trained as a paratrooper. Because of his ethnicity as a Pima, a Native American tribe, he was nicknamed Chief Falling Cloud by his comrades. Quiet by nature, he was pushed to become a national hero when he happened to be one of the Marines who helped in the raising of the replacement flag atop Mount Suribachi on 23 Feb 1945. The photograph by Joe Rosenthal quickly became a national sensation, stirring up American morale. Hayes was recalled to the United States to star in a war bonds tour, but during the tour his problems with alcoholism eventually brought him back to combat. He was disappointed, but the Marine Corps saved his face (or perhaps the Corps' own) by announcing that it was Hayes' own decision to be back with his fellow Marines. He was promoted to the rank of corporal before being discharged from the Marine Corps. ww2dbaseAfter the war, Hayes attempted to lead an anonymous life, only be be disturbed by the occasional visitors. "I kept getting hundreds of letters. And people would drive through the reservation, walk up to me and ask, 'Are you the Indian who raised the flag on Iwo Jima'?" In 1949, along with John Bradley, he was invited to star in the John Wayne film Sands of Iwo Jima, but in the end Hayes and Bradley only apeared in the movie for a few minutes and they hardly acted as consultants; they were simply being used by the producers of the film as instruments of marketing. ww2dbaseOn 24 Jan 1955, Hayes was found dead on the Gila River Indian Reservation. He had been drinking with several others, which led to the official report that the death was related to the alcohol consumed, but Hayes' brothers were convinced that fellow Pima Henry Setoyant had something to do with Hayes' death. The brothers' accusation remained only an accusation. ww2dbaseHayes now rests in peace in Arlington National Cemetery in Arlington, Virginia, United States. ww2dbaseSources: Flags of Our Fathers, Wikipedia. 12 Jan 1923 Ira Hayes was born. 24 Jan 1955 Ira Hayes passed away. What role did Ira Hayes play in World War 2? Seriously!! No one has an answer for me!! It's dumb!!!!!!!!! Ira Hayes was a Marine paratrooper (ParaMarine) who fought on two islands in the Pacific and then on Iwo Jima as an infantry rifleman. He helped raise a large US flag on Mt Suribachi on Feb. 23, 1945. He was sent on the 7th War Loan Bond Tour after the battle with two other surviving flag raisers which helped raise billions to help win WW2. This made him a famous Native American Indian. He was awarded a commendation (medal) in 1946 and his 32" statue is on the Marine Corps War Memorial (1954) in Arlington, VA.
2/23 - I tried to put an Ira Hayes display and photos with all his medals and photos up on his Gila River Reservation and Phoenix VA - all I got from both over a real long time was a run-around. No wonder they named his 1961 bio movie "The Outsider" (Tony Curtis as Hayes). They don't appreciate Americans. They could have done better by naming the Phoenix VA Hospital (named for a politican)after him and or the Phoenix Indian School (now Steel Indian School Park)named after him named for a wealthy contributor. They don't appreciate GI Joe either. Think of the good it would have done for the vets, native Americans, and America. I read in Haye's real bio, "Pima Marine..., 1988", Hayes fought with a BAR-Browning Automatic Rifle. He grew up in a tiny dirt floor building. Arizona has nothing non- military named for him which is where I would like to display him. If he was an alcoholic, it was a PTSD one. One of the most famous Marines, he's on the Marine Corps War Memorial (32' statue) in Arlington. Way this country is going, its going to outsiders. Maybe they rather have Ira Hayes name on a shelter, seems that's where US Americans are heading if not the concentration camps Jesse Ventura talked about in one "Conspiracy Theory" episode. Hayes was such a good Marine they waited to promote him to Corporal just before he was discharged and gave him a commendation (now a medal) just after he was discharged, 2/21/46. They leave out his Marine Occupation Medal, Japan, in his public bio's of his awards including Marine Corps bio's. I even had US Flags flown over the Marine Memorial for him on 2/23 for display. i found something named for Hayes in California, an Indian high school football stadium. They didn't want Hayes either. After WW2 (Hayes) and Korea (Haye's brother) they changed (whoever they are running or ruining this country) reversed the black stenciled combat utilities "USMC/globe and eagle emblem" to globe and eagle emblem/USMC USMC on the bottom for Vietnam. After Vientam the stencils disappeared. So did the tan uniforms and brimmed hats. Now you don't even see the dress uniform around in public - what next? And the Army, you won't find "silver wings upon my chest" (by Barry Sadler, Green Beret, Vietnam), least not the top part of the chest anymore but the bottom. This began for the Vietnam War and Sadler's uniform Korean and Vietnam conflicts. A "Gung Ho" (Oh Rah today football team?) Marine (Marine Raider)took up and raised the US flag on Mt Suribachi too on 2/23/45, but you won't find a book about him. You don't have to be an Indian to be an outsider. Today - As "Dave" pointed out, Ira Hayes would be labeled as a victim of PSTD and all of the side effects it causes. He wasn't crazy, he wasn't stupid or an idiot, he was emtionally stressed out from issues and events he experienced, lived through and survived to live to see the light of day another day. We will never know the demons Ira faced day in and day out, nor do we know with any certainty the deep circumstances under which he died that day on 01-24-1955. Whether or not he dead drunk and fell on his own accord or he was beaten to a dazed stupor in his drunken state and fell to his death. This, we will never know. No one, no matter who they are, needs to die in this manner. Ira for all of his faults, is today, in a much better place for him. God Bless him for his heroism and patriotism to his country and all the other servicemen who fought and died while serving their country in war(s) and in peace time. FYI - Ira's military bio has him being discharged with a rank of corporal from the USMC. While surfing the Internet I came across an odd photo of Ira with the mayor of LA wearing a uniform with the rank of a sergeant, with an insignia of the US Army Air Force on the left shoulder. Very odd. It was included with his military bio data. In my heart, Ira was and is one of America's greatest war heros and we've honored many. God Bless them all. Ira was a great guy, he and a brother came to kentucky, I ended up being born on the Quala, lived a long time in the smokies, indian flats, goose gap, sevierville. No one hates indians, we get looked at like a rarity here in texas. Godspeed, his birthday just passed, we danced, drank, and drummed, and cried, and war cried. 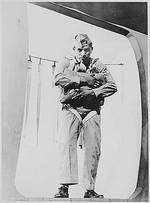 He was in fact an eagle, promoted to Sgt, I have real photo's NO ONE has seen, you are correct, paratrooper, reason i went 101, who else is Army/Air 10th brigade? You do know John R. Hayes was there in Okinawa, Charles W. Hayes was VietNam, John D. Hayes, VietNam, James S. Hayes, Vietnam, S.C Hayes Gulf war, S.C. Hayes, TACP, that man, SC. Speaks every computer language known to man and writes his own, he also speaks 15 languages, maybe he's his great uncle incarnate??? ?